LaserStar offers a wide range of fiber coupled laser welders which are fast, efficient, portable Nd:YAG or Fiber Lasers with fiber coupled optical attachments for high-speed welding applications. Ideal for non-contact welding processes which join two similar or certain dissimilar metals together. 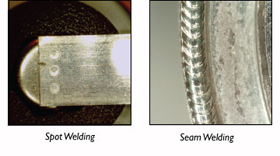 LaserStar laser welding systems can produce both spot (single pulse) and seam welds(multi-pulse overlapping spots), including hermetically sound seams. Contact a laser specialist to learn more about high-speed laser welding applications using Fiber Coupled Laser Welding Systems.